The Rev. Neil Lambert diagrams his ecclesiastical dream. Now I look at my own experience and feel the intimate rightness of Lear’s words: ‘I have taken too little care of this.’…Today it is clear that one’s isolated efforts are straws in the wind, and we can do nothing alone – we need others, all the time… we only begin to exist when we are serving an aim beyond our own likes and aversions. Make visible what, without you, might never be seen. During a 6-hour layover at London’s Heathrow Airport last spring, my friends Neil and Helen Lambert, who live nearby, spirited me away to a picnic in the green fields of Runnymede, where the Magna Carta had been signed 799 years and 50 weeks earlier. Rain fell as we arrived, so Helen and I retreated to the site’s tea room while Neil got the lunch together under the shelter of a great oak. While drinking our tea, we met a British army veteran who had played the trumpet solo at Winston Churchill’s funeral. So in the days following that Runnymede picnic, we began to ask around, starting with some people we knew, who knew some other people, and pretty soon we had collected a group of ten creatives, young and old, from the United States, Great Britain (including a man born in Peru), and New Zealand. There are seven Anglicans, two Methodists and one Baptist. Three are women, seven are clergy. All are practitioners in one or more art forms, including painting, music, film, conceptual and installation art, printmaking, writing and poetry. All have been leaders in the exploration of alternative worship. 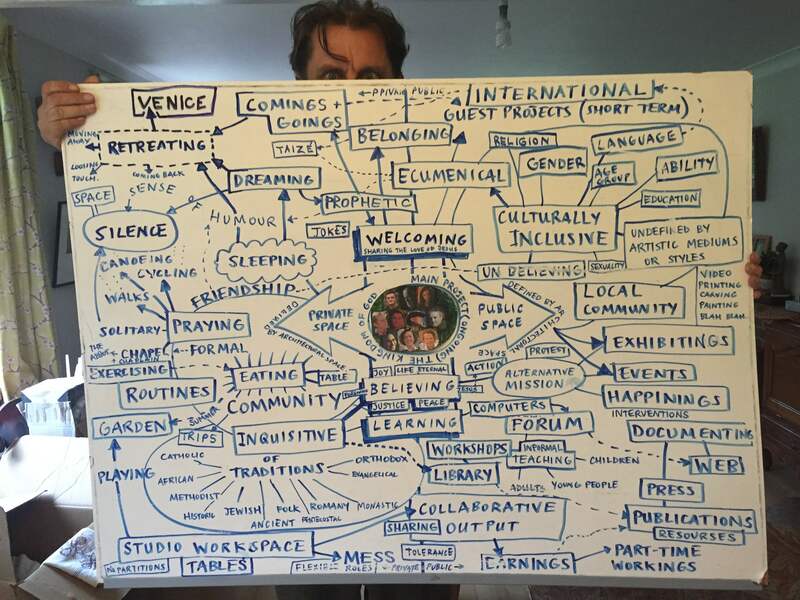 In three weeks, we will gather in Venice to spend seven days in conversation with each other, not only exchanging ideas, dreams and stories, but also listening attentively to whatever the Spirit might have to say through the experimental chemistry of ten such people thrown together in one place. Why Venice? We had to meet somewhere, and monastic housing made it amazingly affordable. And “La Serenissima’s” haunting beauty makes a doubly inspiring venue for creatives, since its renowned wealth of historic art and architecture is augmented by the cutting-edge work on display at Biennale, one of the world’s leading exhibitions of contemporary art. Of course we will each arrive in Venice with our share of specific hopes and dreams. We have been exchanging some of these online already. On the one hand, we all care deeply about the nature, quality and purpose of our common life. On the other hand, we also want to look beyond our walls, making sure the boundaries necessary for identity are sufficiently porous to allow flow both inward and outward. What about those who don’t fit the inherited definitions of Christian? How much diversity can we incorporate and still be the Body of Christ? What do the unchurched or uninitiated have to tell us about who we might be for them – and how they might change us? How can we listen to voices from the margins, and cultures beyond our own? Where might interfaith collaboration lead? As the angel of Resurrection famously said, The tomb is empty and Jesus has left the building. Where should we be looking for Jesus now? In the “other.” In the “elsewhere.” And what does this sometimes unsettling centrifugal dynamic mean for how we are to do and be church? They say democracy was born at Runnymede. To dream that a rebirth of wonder began there as well would be, of course, ridiculously grandiose. We are simply a few of God’s friends gathering in a small room to see what happens. This entry was posted in Anglican spirituality, Art and worship, Arts and Religion, Christianity, The Christian Church, Theology, Venice and tagged Alternative worship, Christian artists, Christian church identity and mission, Christianity and the arts, Creativity in the church, engaging the church and culture, How can the church reach beyond its walls?, networks of Christian artists and creatives, Peter Brook "I have taken too little care", Re-imagining Christianity, rebirth of wonder, Robert Bresson "make visible", T.S. Eliot "wait without thought", The Venice Colloquium "dreaming the Church that wants to be" by jimfriedrich. Bookmark the permalink. Sounds like a wonderful gathering. Can’t wait to see what comes out of it! What a lovely comment. Inspiration is a gift to be shared. The more we pass it around, the more there is. Blessings on your own creativity. Your conference sounds great. I know about the beach huts. Wonderful things go on in Brighton. I will be in the uk next week: giving a presentation on my Camino pilgrimage for St. Mary’s, Ash Vale (at the “Chapel” in the town center at 6 pm, then in London on Monday, Tuesday, and Thursday nights. may the Creator of all things guide and create in your hearts and minds the ways He would,have you go. Stay tuned for posts from Venice. I’m excited to hear about your book. as a student of mark pierson and a curator of worship here in the states, i am VERY interested in hearing more! sad i didn’t know about the gathering sooner, but i’d be interested in keeping up with the creative conversation and being a part of future gatherings! Lilly – Good to hear from you. I know you’ve been doing good work a long time. We will definitely keep you posted.